The current real estate cycle has been stronger and longer than most expected. 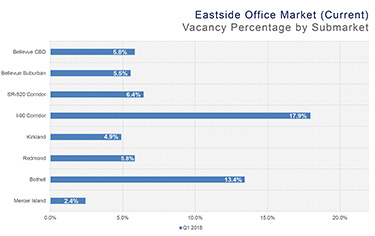 The Eastside office market is like a big game of musical chairs. Tenants are scrambling to look for office space, with diminishing options for them to consider. Driven mainly by large tenants looking for space, there are simply not enough options from which to choose, nor is there a place for everyone to land. Much like a game of musical chairs, it’s getting to the point where some office tenants will end up without a “chair” in this current game. Vacancy rates for the entire Eastside sit at 8.6 percent, a 10-year low and roughly half of where it was in the middle of the latest recession (16.2 percent). 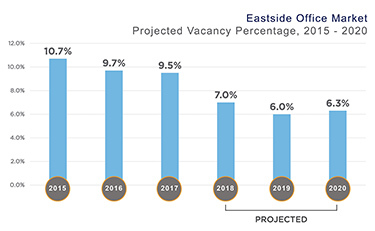 With seemingly no end in sight to the steady demand in the ever-tightening Eastside office market, that number is projected to drop to 7 percent by year end, and down to 6 percent by the end of 2019. The numbers are even more dire for tenants considering highly desirable downtown Bellevue, where Broderick Group vacancy projections are 4.1 percent for year-end 2018 and 2.3 percent for year-end 2019. 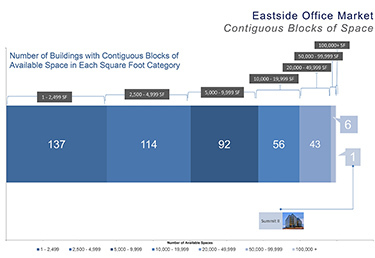 In addition to that, asking rates are at a 10-year high of $36 per square foot annually (inclusive of operating expenses) for the entire Eastside and projected to grow significantly over the next two years before enough supply can be delivered.